When I was looking over all the posts in this blog the other day I noticed I had not posted very much about all the lovely drinks you can make for yourself if you have a sensitive gut. So here is one that you might like. 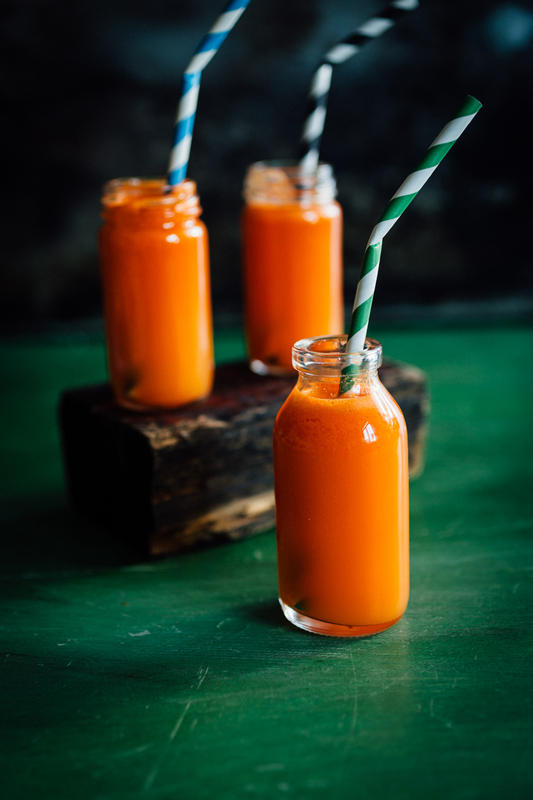 It is one of the simplest, cheapest and most refreshing juices made from carrots, freshly squeezed orange and a knob of ginger. A shot of fresh juice delivers a whole range of nutrients to the body including beta carotene, potassium, vitamin C and a whole lot more. It is also a useful source of energy and water. And the other lovely thing is they do not contain any added sugar. I love the vibrant orange colour of this juices. Just looking at it makes me feel alive and well. There are just a few things to note about making your own juice mixes . Juicing fruit and vegetables removes most of the fibre and so the juice is quite concentrated. It might trigger symptoms in some people. So our advice is only drink a small glass (250ml/ 9 fl oz) and dilute with a little water. Making smoothies on the other hand retains fibre and so most people with a sensitive gut should be able to tolerate the recommended portion of fruit in the form of a smoothie. The flavours of carrot and ginger suit each other well. Ginger is slightly hot and spicy and lifts the earthy flavour of carrot. Ginger is also very soothing for a sensitive gut. Did you know one of the best ways to store carrots and ginger is in a sealed plastic bag in the fridge. They will keep for several weeks without shrivelling up or drying out. Feed the carrots through the juicer and collect the juice in the jug containing the lemon juice. Add the orange juice and then feed half of the ginger through the juicer. At this point taste the juice to check the flavour is to your liking. Add more ginger as you prefer. This quantity of carrots and ginger should yield about 200 ml/7 fl oz juice. Dilute this juice with equal quantities of cold water and serve. 19 Sep	This entry was written by Joan Ransley and published on September 19, 2015 at 6:49 pm. It’s filed under Drink and tagged carrots, Drinks, Ginger, IBS, IBS Network, Juice, LowFodMap. Bookmark the permalink. Follow any comments here with the RSS feed for this post.